14 x 6 Shoemaker Brown Baseboard Return Discounts Apply ! ***Hint: The industry standard is to order using the actual duct/wall hole size and not the existing return cover size. This baseboard return will fit a 14 x 6 inch hole opening. 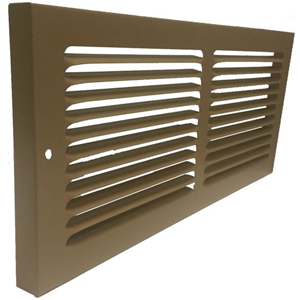 Brown Baseboard Return Faceplate Dimensions (LxH): 15 1/2 x 7 1/4 inches.